In 1974, an Honi opinion piece tackled the state of theatre on campus. “One of the most important [problems] is one shared by all drama groups, professional or amateur, and that is the nature of the facilities available to the particular group,” wrote Mark Radvan, a Honours student at the time. USyd has struggled to provide an answer for its thespians, with adequate venues popping up and disappearing over the years. A year after Radvan’s thinkpiece, one such structure hit the scene. 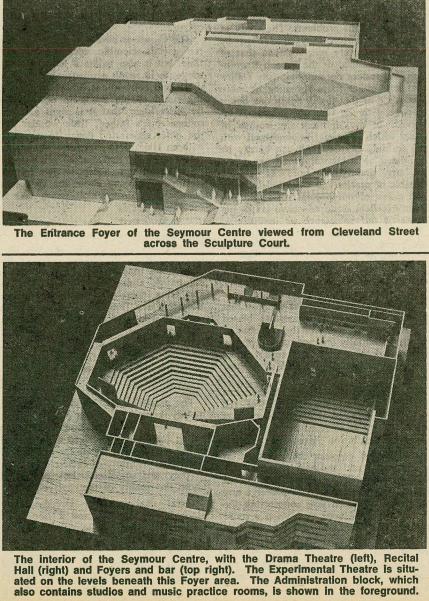 The Seymour Centre was built on the corner of City Road and Cleveland Street with a $1 million bequest from Everest Reginald York Seymour, philanthropist and retail chain magnate. His request was simple: to provide a facility for “musical and dramatic arts” for the people of Sydney. After passing in 1966, Seymour’s funds were entrusted to the University of Sydney, who have owned and managed the site ever since. The performing arts centre is an important site for cultural engagement: it hosts international productions, primary and secondary school students, prolific guest speakers, artists and annual festivals. 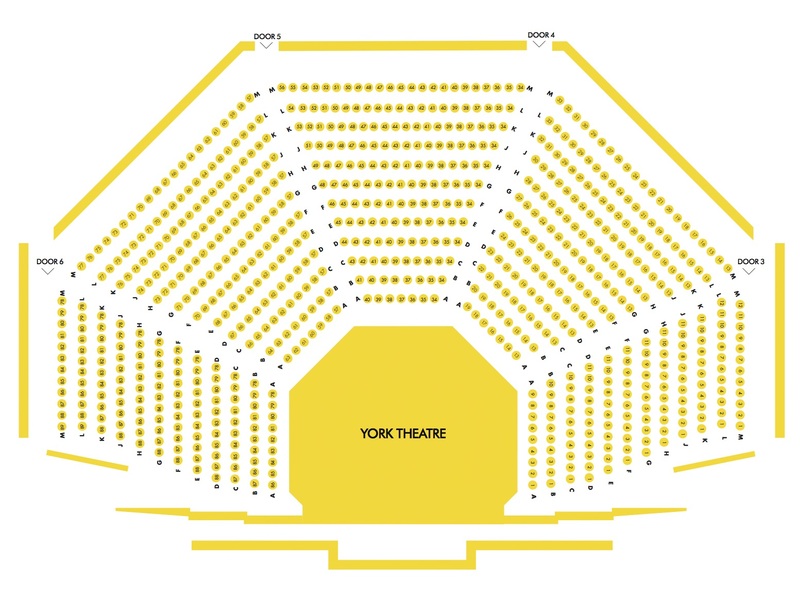 It is comprised of three main theatres, named after its benefactor: the York (near 800 capacity), Everest (over 600 capacity) and Reginald (up to 200 capacity). The Seymour’s reported demographic spans from ‘young inner city dwellers’ of 20-year-old university students, to ‘mature cultural urbanites’ and ‘intellectual oldies’. Historically, the Seymour Centre has struggled to fill vacancies all year round. CreateNSW, the State Government’s arts funding body, couldn’t justify “major public investment” in the Seymour’s future direction “given the theatre’s history of relatively low utilisation and lack of acceptance from the public as a first-class venue”, in a 2011 review. It’s a sentiment shared by John Bell, actor and founder of Bell Shakespeare, who reflected on the Centre in his 2003 memoir. “[I]n spite of having three workable auditoria, the right amount of seats…spacious foyers and good facilities, the place has never taken off, even though it packs out for one-off events and festivals”. He had had some successful productions prior but it was a struggle “to bring the Seymour to life”. “Geographically, it’s in a dead spot and its image is blurred in the public eye—neither quite on or off campus,” Bell said. It’s a view that haunts the Seymour, and makes it a questionable choice for non-USyd productions. The Sydney Morning Herald reported on rumours that the University was looking to repurpose the space as a museum for an unnamed benefactor in 2008. Professor Andrew Coats, who at the time held the now-defunct Vice-Chancellor (Community) portfolio, denied these allegations. However, he said that the centre was “showing signs of age” and “could be demolished and rebuilt.” Artistic Director and General Manager, Tim Jones defended the Seymour six years later, telling the paper that he “angrily disagrees” with the claim that the centre is “awkwardly located” or “unfashionable”. Dating back to the early parts of last century, the burgeoning S.U. Dramatic Society (SUDS) had no on-campus theatre to call home. The smaller SUDS productions were staged in Wallace Theatre or in the upstairs rooms of what is now the Holme Building; and the larger, more spectacular productions were staged in the Great Hall. Students would have to wait until the 1960s for the first bona fide student theatre to pop up on campus, when The Union Theatre was built during extensive renovations of “the Union” (now Holme). 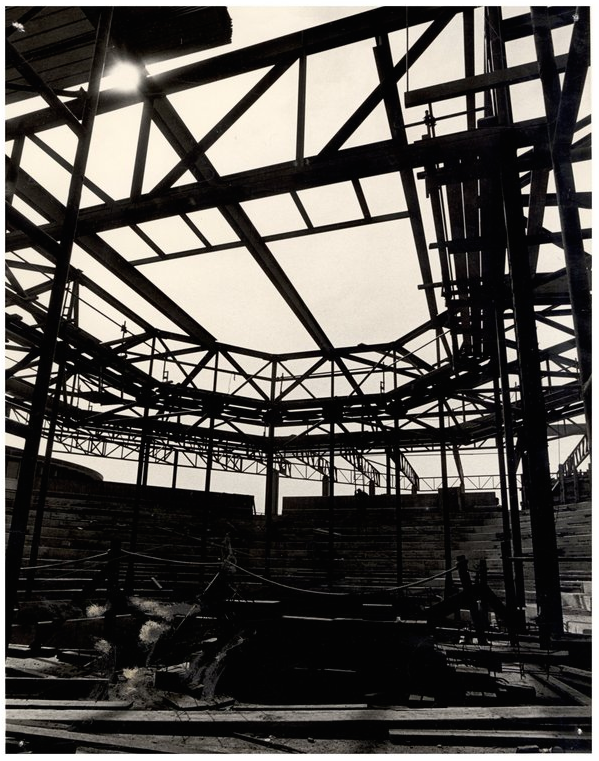 During the theatre’s construction, it was described as “great both as an achievement and an acquisition” for the University, and so receptive to the renovations was the student body that they even copped a 400 percent increase in union fees from £1 to £4 to help cover the costs. For a community of students who had been deprived of a facility like this for so long, the development of the Union Theatre sounded too good to be true. And in some ways, it was. 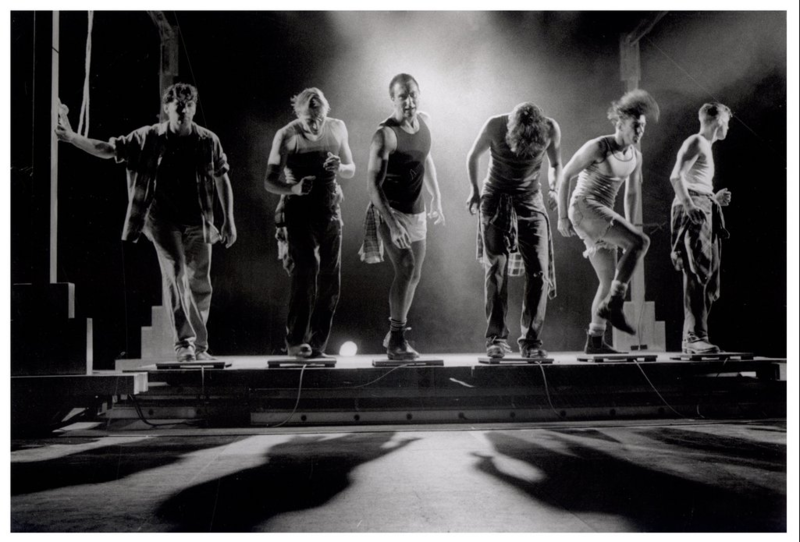 There was an explosion of groundbreaking, phenomenal student theatre in the years that followed, at least, according to campus folklore. But when you pick apart the myth of that era, you start uncovering the same persistent problems with the dramatic arts on campus. The Union, later renamed ‘The Footbridge Theatre’, was not only dirty and poorly-maintained—it was also not free for students to use. And, wouldn’t you know it, that policy about allowing theatre companies to use the space became increasingly useful as a form of revenue for the uni. In the 1980s, the Union even went so far as to lease it out to a professional production company—the Gordon Frost Organisation—which meant that students had an even harder time jockeying for a slot in the program. The Footbridge Theatre was sold in the mid-2000s, along with many other Union-owned properties, to make up some much needed cash. The Footbridge is now just another large lecture hall. There are a few traces that it was once a historic theatre: the dated signage on its former foyer, and the remnants of lighting rigs and catwalks visible in the adjacent Elliott Miller Studio. Now the University is back to having just two main performance spaces. On one side of campus, the Seymour Centre services larger University shows like revues and the major productions of societies like Barbersoc, MADSOC and MUSE. And on the other, you have SUDS’ basecamp, the Cellar: a space where performances are routinely drowned out by the sound of wedding receptions held upstairs in the Refectory. Truly, you’ve never experienced Bassanio’s heartbreaking pleas at the climax of Merchant of Venice until you’ve heard them against a muffled remix of Daft Punk’s ‘One More Time’. The limitations of the Cellar are part of its grungy charm. But even its biggest fans, the SUDS exec, recognise that it is insufficiently equipped to host more adventurous productions such as the annual SUDS major. For the past three years, SUDS have hired off-campus venues to mount their major productions, such as this year’s Love & Information which was staged at Erskineville’s PACT Theatre. As with most cases, USyd is quick to advertise that SUDS is one of the longest continuously running theatre companies in Australia—and slow to provide the appropriate support. The SUDS general meeting, where members decide on what will be the next year’s major production and who will direct it, is held in September, which sometimes leaves less than nine months to write, cast and rehearse an original piece of theatre before opening night. For even a standard play that’s a short turnaround, let alone one that challenges the form of contemporary theatre as many of the SUDS majors do—last year’s major In Two Circles was an immersive experience that was staged in a Camperdown warehouse. It seems unfair that a society of students should have to contend with the organisational power of professional production companies to secure a theatre at their own university, but that’s the reality of the situation which drives SUDS off-campus. It’s not just SUDS that gets a raw deal with the Seymour Centre. If a society or a group of enterprising students decide to mount a production at the Seymour, they can expect that almost all of their budget will be sunk into merely hiring the venue. When the USU allocates the budgets of the faculty and identity revues, the amount that they receive is based on which one of the Seymour’s theatres they have the potential to sell-out. If a revue could feasibly fill the York—the Seymour’s largest theatre—they are granted more money by the USU. Of course, not only does this model favour revues that have already proven they can sell out larger venues, it also guarantees that almost the entire budget goes into hiring a venue which USyd already owns. It may not sound dire, but you can understand why this is frustrating for newer identity revues like Queer or POC when they are contending against established faculty revues like Arts or Science for an amount anywhere between $4000 and $8000. In 2017, a meagre budget allocation led Wom*n’s Revue to forgo having AV sketches because the projector was prohibitively expensive. Even this year, Holt the Musical—a student production that harkened back to the halcyon days of unruly undergraduate theatre—had to get a USU Bright Ideas grant just to hire a theatre at the Seymour. In almost every case, the money that could be going into the production budget for props, costumes and set design—or even into the promotional budget to bring in bigger, non-uni crowds—is going straight into hiring theatres that the University itself owns. The high fees are understandable in the current arts climate—earlier this year, CreateNSW was criticised for scanty project commitment. In an Arts Funding Program Review submission by the Seymour Centre in 2013, Tim Jones challenged the decision a year prior that NSW Universities were ruled ineligible to apply for future Arts NSW program and project funding. Similarly, Jones wrote to the Parliament of Australia to respond to the 2014/15 Federal Budget, expressing fear that “without a substitute funding pot for core funding, it is possible that organisations of significance will not be able to continue operations entirely or at current levels”. As part of its bequest, the Seymour runs as a non-profit organisation. It remains unclear what role the University plays financially, or how much they invest in it. The Centre has not featured in the USyd’s financial asset reports since 2014, nor are the Seymour Centre’s annual reports publicly available. To make up for the lacking government funding at a state and federal level, the Seymour relies on sponsorships and partnership opportunities to stay afloat. Its function space often hosts once-off private events, with corporate hiring in the past seeing Microsoft, Sony and Peugeot taking advantage of the space. During the March showing of Sydney Uni Revue, staff reprimanded students for walking through the foyer during rehearsals, due to a Dyson event being prepared outside; it is clear which of the paying clients were valued more. Despite a focus on all members of the community in the bequest—students cannot always be prioritised. Although unconfirmed by the USU, Honi understands that the union plans to build a full theatre on one of the levels of Manning House, possibly challenging the role of the Seymour Centre on campus. Entertainment business Century Venues acquired Manning Bar last year. If it goes ahead, Century Venues will no doubt create a professional performance space, keeping with the standard of its other managed venues: the Enmore, Metro and Factory Theatres, the Comedy Store and Chatswood’s Concourse. However, according to the University’s Campus Infrastructure Services (CIS), the University would still need to find a donor, sponsorship or alternative fund backing to put this plan into action. The worry is that this venue might have no obligation to students at all. Given the kind of events that Century Venues organises for its other, very successful venues, it wouldn’t be surprising if smaller student events at Manning were scrapped in favour of big bands and established comedians. But wouldn’t it be great if, for once, USyd students had access to a state-of-the-art theatre that prioritised their needs, nurtured their talent and didn’t charge them an arm and leg for the privilege of using a theatre on their own campus. Maybe some healthy competition will be enough to drive the Seymour’s prices down a bit. Or maybe the Manning Theatre will be even more expensive and less accessible than the Seymour Centre is now. Only time will tell. In 1972, when the Seymour was first approved by the University’s Senate, it was designed to provide seamless operation for both “the highest professional demands yet [still] permit simple operation when required by amateur or student groups.” At Everest Seymour’s request, the Centre’s core purpose was to serve Sydney–all of Sydney, and everyone within it. The Seymour’s dedication to the University’s students and campus theatrics is unquestionable; however in the name of financial viability and pleasing the general public, it simply cannot give students alone what they need. At the bare minimum, the Seymour Centre provides an adequate, dedicated performance space for the University’s theatrical and musical groups. USyd has never had a theatre as well-equipped or professional as this—but it has also never had one so challenging to organise a performance in. Students deserve a performing arts centre that feels like it belongs to them. A university’s theatre should be free, accessible and prioritise student productions over outside companies. The Seymour Centre could be that theatre—if it would just scooch a couple of metres back towards the campus.